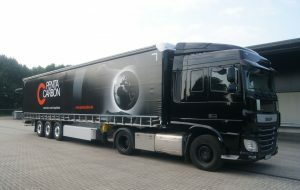 Just in time for our company’s 10th anniversary, our PentaCarbon truck rolled onto our premises in Haltern am See. In collaboration with one of our largest logistics partners, we designed and realized our PentaCarbon truck. The tarpaulin is printed with our logo and our slogan “carbon black, a world of applications” which refers to the versatile field of applications of Carbon Black. The driver’s cabin of course was bound to be deep black. The truck is to be deployed as a pilot vehicle for the transport to central geographically dispersed customers in order to increase our service level. It is also to serve as an advertising channel, for PentaCarbon is globally active as a manufacturer, distributor and trading company for Carbon Black. The inauguration of the new truck was celebrated with a small solemn reception among the PentaCarbon staff and forwarder representatives. We are looking forward receiving any pictures of our PentaCarbon-truck via contact@pentacarbon.de or feel free to post them on Facebook. If you have any questions regarding our products or services, please do not hesitate to contact us.